Dr Jotham Scerri-Diacono and Dr Caroline Risiott were invited to deliver lectures during the ELSA Summer Law School, which took place at the University of Malta between the 20th and 24th August. 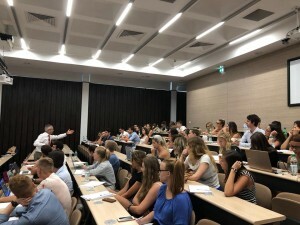 The annual social and academic event, organised by ELSA Malta, attracts law students from across Europe to visit Malta and learn from top local shipping lawyers and professionals. On the second day, Dr Jotham Scerri-Diacono, partner within the firm’s Shipping practice, delivered a lecture on Claims and Enforcement on Ships (featured below), while Dr Caroline Risiott’s presentation focused on Ship Finance.